You have made a large investment in your SEM Disintegrator. Like a fine automobile, our machines also need regular maintenance. Would you buy a Mercedes and then never change the oil? No way! 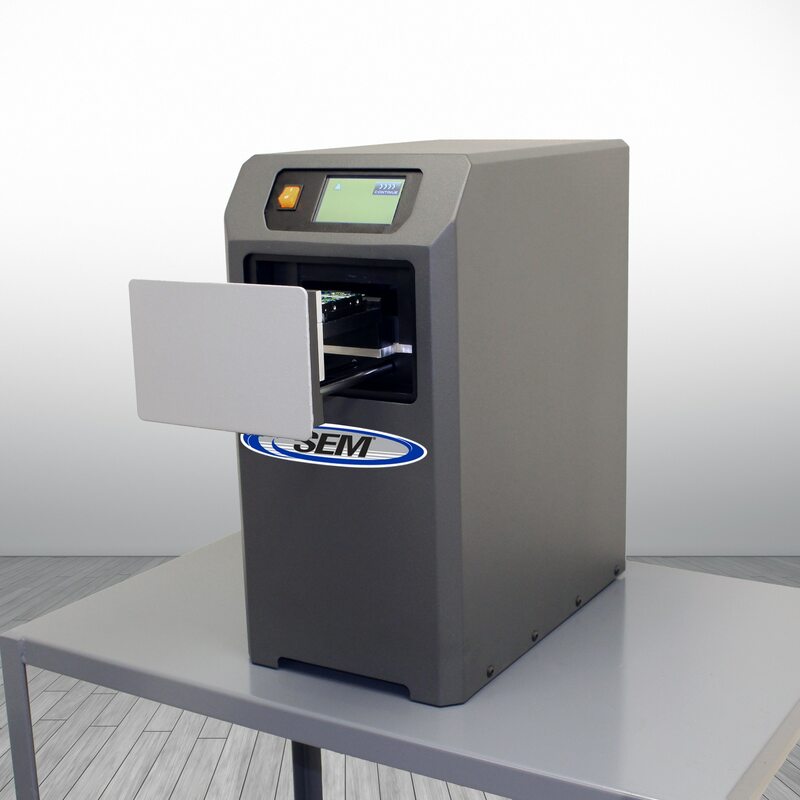 SEM disintegrators are ruggedly designed with precision built knife mills and with proper care and regular maintenance they can and will perform for decades. Disintegrators operate with very close tolerances to efficiently cut paper. The 5 blade rotor rotates at over 600RPM and within five thousands of an inch over the bed knives. This action creates a very efficient cutting machine-like a big pair of scissors. However, sharp blades and proper tolerances are the key to good performance and avoiding a host of symptoms that slow you down, waste time and energy, put undue stress on the machine components and can cause premature failure of motors, belts and even cause cracks in the machine itself. If you don’t want to replace your machine earlier than necessary, than the proper maintenance is absolutely vital. Sharp blades improve performance, productivity while reducing airborne dust and noise. Dull/worn blades can lead to too much of a gap between the rotor knives and bed knives, which will make the machine prone to jamming. Dull blades will also lead to a “pounding” of the paper instead of cutting. This condition creates a lot more dust and noise and will certainly require longer run times to process paper through the screen, and a longer run time is more costly in terms of power usage, employee time and lost production. Also, this “pounding” of material if allowed to continue can ultimately cause stress cracks in the hopper and base and potential machine failure. Greasing the bearings, as we do during a PM will also lengthen the life of the equipment. Without regular maintenance and grease the bearings can dry out causing the rotor to turn irregularly, which can- if severe cause knife damage. Replacing bearings is a costly repair that can be easily avoided with regular maintenance. Your machine will jam more frequently as blades become dull and wear down. Jams are not only a pain to have to clean up, but repeated jamming causes undue wear on vital machine components and can put your machine in an early grave. Fan systems are another key component of your disintegrator system. The fan systems ensure that the shredded material is moving properly through the system. Once the desired particle size is achieved and it falls through the screen, the fan system evacuates it out and deposits it into a waste bag, outside container/compactor or briquettor for disposal. The filter system takes the air used to remove the particles from the machine and filters the dust particles before exhausting the air back out into the room or exhausting it outside. Regular bag/tube change to ensure efficient operation. Filter tubes should be checked regularly and replaced when they show signs of damage or wear. Without proper airflow through these tubes or bags the filters become much less efficient increasing the dust levels. If not corrected, jamming can occur, which in turn can clog and jam up the whole system—Something you want to avoid if you can. Flex hoses/duct work are also inspected and should be replaced as holes appear, since any loss of pressure/CFM will cause more dust coming out of the hopper of the machine as well as particulate and dust leakage from the hose/duct, creating a very dirty operating environment. This loss of pressure also slows down the removal of the particle from the machine, and in severe cases can also cause a jam. We recommend all disintegrator users set up an SEM 20 Point PM service contract so that they can get the most production possible out of their machines, reduce downtime, protect your warranty and avoid the pitfalls caused by poor maintenance practices. SEM provides direct and Authorized Service Representative Preventative Maintenance on many different models and brands of disintegrators and shredders.